I took a look at Salo's US Launch Schedule and he has a recent date for CRS-11 as NET March 7. If that holds, that would seem to be the next flight if SES-10 is late February. Still pretty impressive to see a booster going for testing when there is 4 launches (Iridium, Echostar, CRS-10, and SES-10) that seemingly have first stage cores already tested. I took a look at Salo's US Launch Schedule and he has a recent date for CRS-11 as NET March 7. If that holds, that would seem to be the next flight if SES-10 is late February. CRS/SpX-11 is extremely unlikely to fly on March 7. Given the current target date of Feb 8 for SpX-10, its planned duration at the ISS would overlap with an SpX-11 launched on that date. That target date is only four weeks from today, and it's supposed to be the second flight from LC-39A, which has yet to see any rocket erected on it. Then there is the berthing of OA-7, which was supposed to happen in the same early March timeframe. That says that this booster is probably for some other missions. According to Robin this info was relayed to him "as background" during a recent interview with SpaceX. Mentioning here because this tweet, and a second one citing SpaceX, have since been deleted. Publishing/tweeting/conveying info shared 'on background' is generally bad form. That said, if SX expressed this it represents big confidence on their part. Thank you, Johnnyhinbos, for grabbing a screencap while this was up. That's their plan. They've got over 30 launches on the manifest right now. If they do just half that many, they're doing fantastic. That would be 6 Atlas V, 1 Delta IV, and 1 Minotaur IV, so the remaining 24 go to SpaceX. This even more than the 22 East coast launches on starhawk92's manifest above. But it does not help with *realistics*... Twenty two is still way too high. There is a poll for the number of Spacex launches this year, that would be a more appropriate place to put our guesses. This thread is for discussion of what flights should be listed on the manifest and what publicly known information we have on when they are scheduled to launch. 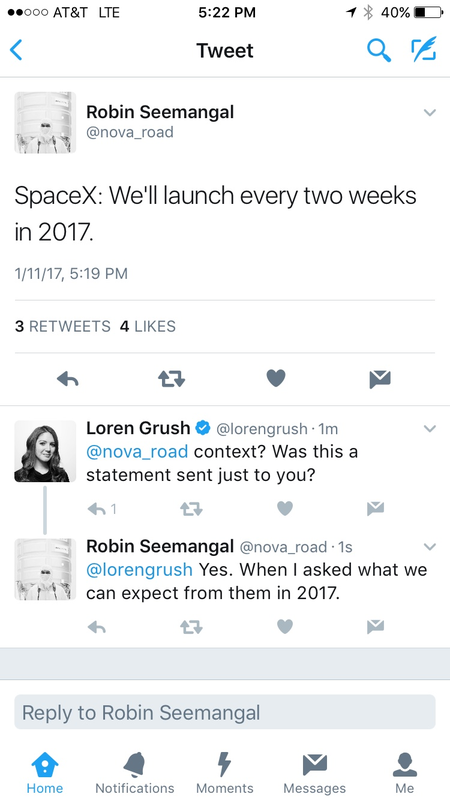 Whether SpaceX will achieve the schedule is discussed in plenty of other threads. Think of the estimate for SpaceX east coast launces this way in 2016 there was 23 launches and SpaceX did only 8 of them. If SpaceX is responsible for the increase to 32 over that done in 2016 that is only 17 launches. But now add the 6 to 8 launches from VAFB and that is 23 to 25. So 2 a month is an accurate view of the average. Now can SpaceX meet that kind of launch rate? SpaceX can manufacture cores at a rate of at least 18 /yr. Now add 4 or 5 cores manufactured since Sept 1 and that is a total for 2017 of 22 or 23. The main thing to look at is the number of upper stages. If for every FH launched SpaceX does 2 reuse launches then the total launches is still controlled by the number of US manufactured. Making the max possible for launches including FH and reused 1st stage launches for 2017 at 22 or 23. If the 1st stage reuse program is successful (technically and financially), then the manufacture program in 2018 can start shifting to produce 2 or more US for each 1st stage that it would have produced. If just 3 1st stages are switched to producing US then the rate is 15 complete cores and 9 more extra US. This is enough for 24 launches in 2018 of 15 new booster launches and 9 reused booster launches. So to find the max launch capability for a year look to the manufacture rate of the US for a year. I agree with you, and had not intended to start a discussion. Certainly not a repeat of the discussion in the Launch Poll where everyone guesses for this years total. I was just comparing the statement from CCAFS to our manifest as some kind of supporting evidence. This says we don't have to start moving our posted launch dates out beyond 2017. Back to the proper subject, NASA Goddard Spaceflight Center's Raven team has just sent out invitations to team members to view the launch (and first stage landing!) of SpX-10 from the Banana River campground on February 8. Confidence is low that the launch will happen on that day, or even close, but people are still preparing for it. particularly, the third figure in it - shows that SpaceX plan 27 launches this year. Accordingly to the article this number is not an author's estimate but reflects current plans of the company. Therefore it seems to me it should be reflected here in this thread. In the extended interview with Gwynne Shotwell, on the CBS This Morning podcast, she says SpaceX are aiming for 20 - 24 launches this year. Edit: I should have added she then said "and then increase may be 50% annually"
The table is misleading with the ariane numbers. Ariane 5 can only launch 8x annually, the restricting factor is the amount of solid boosters they can produce. I think, the amount of satellites planned is listed in the table. As are the launches executed. Arianespace launched 9 comsats in 2016, if I'm not mistaken. SpaceX also has done a tandem comsat launch in the past. Comparing planned amount of satellites, with executed amount of launches, is an apples to oranges comparison.! The chart is based on company data from early 2016, so it does not necessarily represent their current plans. Still relevant to see in this thread, even if it is a year old at this point. With a successful launch and landing time to move the Iridium Next Flt 1 to above the line. Has anyone seen news about B612 actually coming up with money to build that project? I don't think it belongs on the manifest yet. Edit: Bringing things like this to our attention on the manifest thread is good if you see a reference to a Falcon mission. We just may not want to actually list it on the manifest if it doesn't seem to be a firm contract.